Talismanic Indian football team captain Sunil Chhetri, on Tuesday, rated Lionel Messi as the greatest player of all time but did not include Argentina among his favourite four teams to lift the World Cup in Russia. "If you're asking me four good teams then I would say Germany, Spain, Brazil and France look really strong," Chhetri said. "I hope some other team proves me wrong. England are darkhorses, while Belgium have a very good side." 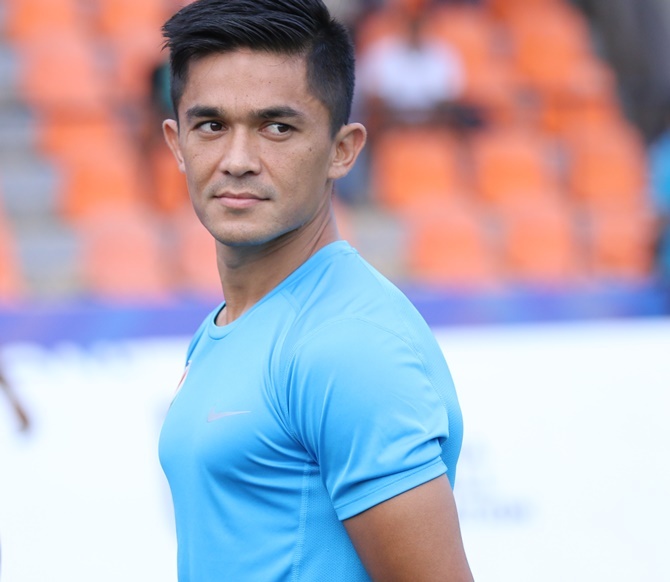 Chhetri rated Lionel Messi as the "greatest player to have ever played the sport" and hoped he lived up to his fans' expectation by lifting the World Cup. "I will be very happy if he scores. I am his fan. I don't take comparisons seriously. I don't think anyone should. These are baseless. I hope Messi scores and Argentina do well," Chhetri said. "A lot of people say that since he hasn't won the World Cup, he is not a great player or whatever. I think he is the greatest player ever to play football. He is extraordinary. I just hope, for his sake, that he does well and Argentina win the World Cup." An ardent Spain supporter, Chhetri said the spotlight would be on Andres Iniesta who has hinted about his retirement. "The team which I really like to watch is Spain. I like the way they play football," Chhetri said. "I don't want to take names. It's time to watch the best players play against each other. I think that is the whole thing of World Cup. It comes in four years. As neutrals, just enjoy it as there are so many players to watch out for." He equalled Messi in the number of international goals (64) but Chhetri rubbished the comparison with the Argentine superstar. "When I hear about the comparisons, I get happy for five seconds and then forget it. There's no comparison whatsoever. Messi and Ronaldo are two of the best players ever to play football. We are Indians. Please be happy for five seconds and then forget about it," he said. Chhetri further said Messi and Ronanldo may play the 2022 edition of the World Cup as well if they keep themselves in shape. "I don't think this would be Messi or Ronaldo's last World Cup. They are so fit. Let's turn our attention to Iniesta who is such a gifted footballer. This is set to be his last World Cup so let's enjoy him play," he concluded. Will we see a 'brave' and 'aggressive' England in Russia?